a son of kings, no mortal thrall." of baseborn, nor spy, nor thrall. from any Elf, be he king or no." 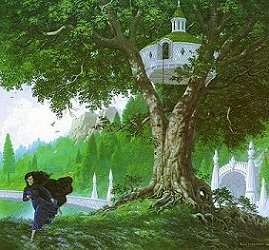 Thingol, rightly afraid that Lúthien would follow Beren, had a house for her made in the limbs of a tree called Hírilorn. There he placed her, and he set guards about the tree. 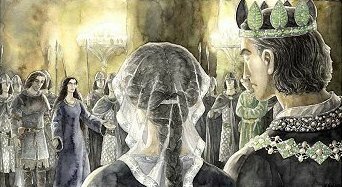 Lúthien was a prisoner in her own father's kingdom, and for such treatment of her person and of her Love, she decided to defy her father, and flee Doriath to find and aid Beren him in his Quest. tamed him that death nor monster fears." Huan was the name of this fearsome hound, but he was more then just a hound, he was The Hound of Valinor. The Valar Oromë had given him as a gift to Celegorm son of Fëanor. Huan was Celegorm's faithful companion and had even followed him into exile in Middle-earth. No enchantments or magic spells could fool Huan, and he found Lúthien with no problem. 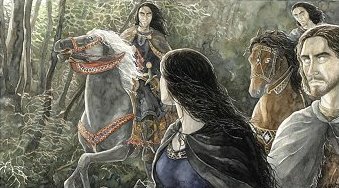 Huan took her to his master Celegrom, but Celegorm and his brother Curufin mistreated Lúthien. They abducted her and tried to force her to marry Celegorm. 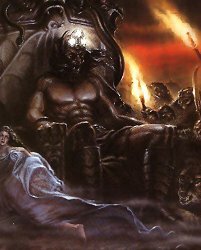 Celegorm knew full well that his king Felegund and Beren had been imprisoned by Sauron. Celegorm purposed to let them both die, and by marrying Lúthien, he could secure his claim with Lúthien's father's support. 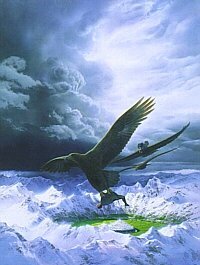 Huan, percieving his master had turned evil, helped Lúthien to escape. 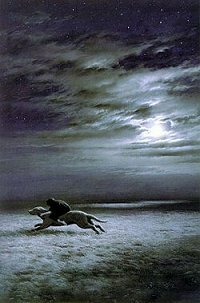 Huan allowed Lúthien to ride upon his back like a horse, and so they arrived at an isle where Sauron had Beren imprisoned. and the foul vapor of his breath. There befell the battle of Huan and Wolf-Sauron,"
After Huan defeated Sauron, Lúthien and Huan helped Beren to escape, and the three then traveled on to the North, toward Angband, Morgoth's foul and evil dungeon-fortress. Beren was afraid for Lúthien, so one morning he bade Huan to guard and protect her, and he left her sleeping upon the grass, continuing the way without her. more fair then mortal tongue can tell. that Lúthien for a time should be." 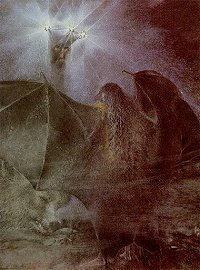 Beren knew it was suicide to enter Angband and directly confront Morgoth, he could not bear the thought of Morgoth destroying Lúthien along with him. Lúthien however heard his song of lamentation and went after him. But Beren was afraid of her, for Lúthien had disguised herself as the vampire-messenger of Morgoth's - Thuringwethil - and Huan was the horrifying werewolf Draugluin (whom Morgoth did not know was dead yet). Yet from such a foul creature came Lúthien's fair voice! They halted before Beren, and cast aside their disguises, thus they were reunited, but it was here that Huan had to part ways with them, as they needed his Draugluin-disguise for Beren. 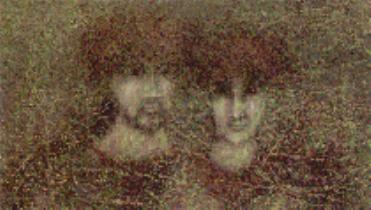 But as they fled from the gates of Angband, Beren and Lúthien met with Carcharoth, Guardian of the Gates of Angband. The greatest of the evil wolves, Carcharoth never slept. He saw them coming and Beren attempted to fight Carcharoth....whereupon he lost his hand to the wolf, it was the hand clutching the Silmaril. The jewel was a burning agony in Carcharoth's belly and he went mad, running away into the surrounding lands, destroying all in his path trying to relieve the searing pain. Beren, now badly hurt and Lúthien made their escape from Angband, and went back to Doriath. in anguish sinking to the ground." 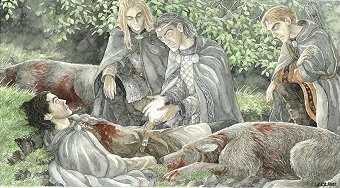 Beren cut the Jewel from Carcharoth's belly and returned it to King Thingol, but his doom was written, and Beren also died from his wounds. Then Lúthien, in her grief, began to waste away. She decided to confront the Lord of the Dead, Mandos and ask for a second chance. She sang songs of such sadness, that she persuaded Mandos to give her and Beren that second chance at life, but he had a price, Lúthien had to give up her right to immortality in the Grey Havens, the place that elves go when they die, or when they tire of life on Middle Earth. She would be dead in truth, just like a mortal human. And so ends the Tale of Lúthien and Beren.